HappyFresh delivers groceries from the stores you love to your doorstep in as little as one hour! Our professionally-trained and experienced Personal Shoppers pick the best produce and items while our Drivers deliver them speedily and safely to you. 2. What stores are supported? HappyFresh strives to partner with high-quality supermarkets and specialty stores near you, offering a full and varied selection of items at a range of price points (from low to high). Please note that HappyFresh is an independent company that is not owned by any of the stores we cover and is not necessarily affiliated with, endorsed, or sponsored by any of the retailers mentioned on this website (including but not limited to Village Grocer). 3. Do you serve my area? Currently, we serve selected areas in Klang Valley, Penang island and Johor but we are constantly adding new stores all the time. You can check if HappyFresh serves your location by downloading the App or using our Website. Simply enter your area or postal code to see what stores are available in your location. We are coming to more areas soon! 4. How fast do you deliver? Very fast! We can deliver to you in the next 1 or 2 hours, or at any other one-hour or two-hour time-slot today and in the next 6 days. 5. How much is the service fee? Our service fee varies based on store, delivery distance and time slot that you have selected. Some of our stores have extended coverage areas. If the delivery distance from that store to your location is outside of the normal coverage area, an additional charge of RM1 per km will apply. Please note that there are no free delivery thresholds for all our stores. If you are unsure about the service fee applicable to your order, please make sure to check either via the Delivery Checker page or at Checkout, before confirming your order. 6. What are the delivery hours? Our delivery hours are based on the opening hours of the stores we work with. For most stores, we can deliver between 10 am and 9 pm, Monday to Sunday (including Public Holidays). 7. Is there a minimum spend? For most of our stores, there is a minimum spend of RM50. However, please note that the minimum spend varies from store to store. 8. Can I collect any kinds of club/loyalty points from the supermarkets? Currently, we do not support the collection of membership points or other savings from stores. For HappyFresh purchases, you are not allowed to use store vouchers (i.e. Tesco vouchers, Cold Storage vouchers, etc), unless they are authorized by us. However, be sure to keep an eye on your email and social media for updates on how we’re working to improve this functionality. 9. What happens if something is out of stock? When something is out of stock at the store, we do our best to replace it with a similar item. After checkout, you can choose to let your shopper pick the replacements themselves, have them call or message you with suggestions or ask that no replacements be provided at all. 10. Are there price differences from the store? Where the store is labeled as having “same prices as in-store” on the store selection page, we will endeavor on a best-efforts basis to charge the same price as in-store. However, due to certain circumstances outside of our control (for example, technical issues or sudden price changes in store), there may be small, temporary inconsistencies in our pricing compared with the physical store. Where the store is labeled as having prices that “may vary from in-store”, our prices will differ from the in-store price due to a small service charge that we add to the in-store price. In either situation above, if you notice an item that you think is priced incorrectly, please reach out to us and we will strive to find a fair solution! We reserve the right to cancel items that are priced incorrectly. 11. How do you treat items that are non-Halal? We allow you to buy non-Halal items using HappyFresh and are very careful to ensure that at no point during checkout, delivery, or at any other time, do Halal and non-Halal items get in contact with each other. 12. How do I check the status of my order? You will be notified in real-time when your order is packed, when it is on its way and when it has almost arrived. Remember to turn on your push notifications in your phone settings. You can also go to “My Order Status” to check on the status of your order. 13. How can I edit or cancel my order? Once your order is placed & our shopper has started picking the items; for technical reasons, you cannot cancel your order. However, you have the option to check all your items before accepting them at the door. 15. How do I report a problem with my order? If you have any problems with your order, please tell us! You can call us at 03 – 9212 0192 or simply write to mysupport@happyfresh.com. Please note that complaints or requests requiring refunds must be made within three (3) days after your order has been delivered. Please note that refunds for perishable and/or semi-perishable goods (example fish, vegetables, dairy products, fruits, bread, onion, potato, pies, cake etc) will only be considered if these items are rejected at the time of delivery. Refunds will not be provided if you do not reach out to us regarding your desired refund within the aforementioned time frames. 16. What happens if I choose to pay by card? We will authorize a small sum for card verification purposes. You will not be charged for this amount. If you choose to pay by credit card, we will charge your credit card for the Total Bill based on the Goods delivered and accepted upon the completion of your Order. Your bank will update the final charge on your statement accordingly after delivery. If you choose to pay by debit card, you may be charged / pre-authorized the amount billed once you complete the Order at the checkout cart on our App/Website. Upon delivery, (i) if your final amount is higher than the amount paid during checkout cart, your debit card will be charged the new final bill and the initial charged / pre-authorized amount as stated in the checkout cart will be returned to your debit card; and (ii) if your final amount is lower than the amount paid during checkout cart, the balance will be refunded in accordance with your bank’s standard practices. 17. When will I receive my refund? If you paid using credit or debit card, your refund will be paid back into your card in accordance with bank’s standard practices. Please note each issuer bank will have different time periods to reflect the refunded sum in your bank account/ statement. If you paid using cash on delivery, your refund will be paid to you in the form of a voucher code, which will be sent to you within 5 working days. This voucher code will entitle you to a discount on your next order. 18. How do I review my receipt? You will receive your receipt via email after you have received your delivery. 19. How do I return my HappyFresh bags? We encourage you to return your HappyFresh bags that are still in good condition to your next HappyFresh driver for reuse. Feel free to use them for your own errands, too! Please note that due to stock availability, we do not always provide HappyFresh bags with your order. 20. How do I return items? Should you find that any items you receive are incorrect or not up to your satisfaction, you can reject it on the spot by letting our driver know. We will only charge you for items which you accept. Once you have confirmed the items you have received and accepted them, the transaction is considered finalised and any further returns will be up to management discretion. If you believe you have a valid reason or complaint, please ensure to contact our customer service via mysupport@happyfresh.com within 72 hours together with photographic evidence (where relevant). 21. Who will select my items? Your grocery will be selected by specially screened and professionally trained Personal Shoppers. 22. Who will deliver my order? Your orders will be delivered by our drivers using motorcycles equipped with a specially designed and custom-built delivery box. 23. What happens to my discount if there are items out of stock? All our promotions apply to the net value of the delivered items (Adjusted after out of stock replacements). For example: If you place an order worth RM200 and have a discount code for 20% OFF on your order. However, in cases where your original RM200 has RM60 worth of out of stock items; the 20% discount will apply to the net value of your order i.e. RM140. 24. Can I order from multiple stores within one order? Currently, shopping for groceries from more than one store within one order is not supported. However, you can always make two or more orders from different supermarkets and specialty stores with your preferred delivery time slot. 25. Can I add shopping notes (e.g. cut the chicken, clean fish) to the products I ordered? Yes, you can see a section named “Add notes for shopper” below every item you have placed inside your cart. Tap and type your request! Our Personal Shoppers will try to fulfill your requirements. Regulations of supermarkets apply. 26. Does HappyFresh deliver to offices? Yes, of course! Moreover, if you want a more fitting grocery delivery service for your monthly office pantry needs, feel free to contact HappyCorporate. 27. I have many more questions for you! Let us know! We will be waiting eagerly at mysupport@happyfresh.com or give us a call at 03-92120192. HappyFresh menghantarkan barangan runcit dari kedai kesayangan anda ke hadapan pintu anda sepantas satu jam! Pembeli peribadi kami dilatih secara profesional dan berpengalaman memilih barangan terbaik manakala Pemandu kami menghantar mereka cepat dan selamat kepada anda. 2. Kedai-kedai mana yang disokong dengan HappyFresh? 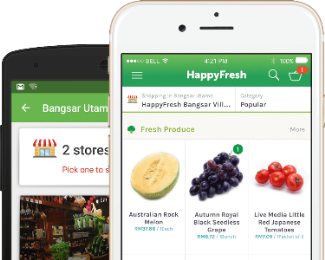 HappyFresh berusaha untuk bekerjasama dengan pasar-pasar raya kualiti tinggi dan kedai-kedai istimewa berhampiran anda, menawarkan pilihan yang menyeluruh dan berbagai-bagai pada titik harga pelbagai (dari rendah hingga tinggi). Walau bagaimanapun, dibawa kepada perhatian anda bahawa HappyFresh ialah satu syarikat persendirian yang tidak dimiliki oleh mana-mana kedai yang kami liputi dan tidak semestinya bergabung dengan, menyokong, atau ditaja oleh mana-mana peruncit yang dinyatakan pada laman sesawang ini (termasuk tetapi tidak terhad kepada Village Grocer). 3. Adakah HappyFresh berkhidmat di kawasan saya? Buat masa ini kami berkhidmat di kawasan terpilih di Lembah Klang, Pulau Pinang dan Johor tetapi kami sentiasa menambah kedai baharu sepanjang masa. Anda boleh memeriksa jika HappyFresh berkhidmat di lokasi anda dengan memuat turun Aplikasi atau menggunakan Laman Sesawang kami. Anda boleh memasukkan kawasan atau poskod anda untuk melihat kedai apa yang tersedia di lokasi anda. Kami akan beroperasi di lebih banyak kawasan tidak lama lagi! 4. Berapa pantas anda melengkapkan penghantaran? Sepantas mungkin! Kami boleh menghantar kepada anda dalam masa 1 atau 2 jam, atau pada mana-mana slot-waktu satu-jam pada hari ini dan pada 6 hari yang akan datang, bersesuaian dengan pilihan anda. Yuran perkhidmatan kami akan berbeza berdasarkan kedai, jarak penghantaran dan slot masa yang telah anda pilih. Beberapa pasaraya telah kami lanjutkan jarak penghantaran. Jika jarak penghantaran daripada pasaraya tersebut menuju ke lokasi yang berada diluar kawasan liputan, caj tambahan sebanyak RM1 bagi setiap km akan dikenakan. Sila ambil perhatian bahawa tiada ambang penghantaran percuma untuk semua kedai kami. Jika anda tidak pasti akan caj penghantaran bagi pesanan anda, sila periksa di bahagian Delivery Checker atau ketika Checkout sebelum mengesahkan pesanan anda. Waktu penghantaran kami adalah berdasarkan waktu pembukaan kedai yang bekerjasama dengan kami. Untuk kebanyakan kedai, kami boleh menghantar antara 10 pagi dan 9 malam, Isnin hingga Ahad (termasuk Cuti Umum). 7. Berapakah perbelanjaan minimum yang dikenakan? Untuk kebanyakan kedai kami, perbelanjaan minimum adalah sebanyak RM50. Walau bagaimanapun, sila ambil perhatian bahawa perbelanjaan minimum berbeza untuk semua kedai. 8. Bolehkah saya mengutip apa-apa jenis mata kelab/ganjaran dari pasar raya? Buat masa ini kami tidak menyokong pengumpulan mata keahlian atau simpanan lain dari kedai. Untuk pembelian melalui HappyFresh, anda tidak boleh menggunakan baucar store (contohnya baucar Tesco, baucar Cold Storage, dll), melainkan jika dibenarkan oleh kami. Bagaimanapun, pastikan anda memerhati pada emel dan media sosial anda untuk apa-apa perubahan terkini tentang usaha kami untuk meningkatkan kefungsian ini. 9. Apakah yang berlaku jika sesuatu produk kehabisan stok? Apabila sesuatu produk kehabisan stok di kedai, kami akan berusaha sebaik mungkin untuk menggantikan ia dengan barangan yang hampir serupa. Selepas semak keluar, anda boleh memilih penggantian khusus untuk sebarang produk, atau meminta untuk tiada penggantian. Jika perlu, Personal Shopper anda akan menghubungi dari kedai untuk mengesahkan barangan gantian. 10. Adakah ada perbezaan harga dari kedai? Kedai yang dilabelkan mempunyai “harga sama seperti di kedai” di halaman pemilihan kedai, kami akan berusaha untuk mengekalkan caj harga yang sama seperti di kedai. Walau bagaimanapun , dalam keadaan tertentu di luar kawalan kami (sebagai contoh, isu teknikal atau perubahan harga secara tiba-tiba di kedai), kemungkinan untuk sementara waktu harga kami berbeza dengan harga dari kedai fizikal. Kedai yang dilabelkan mempunyai harga yang “mungkin berbeza dari kedai”, harga kami akan berbeza dari harga kedai kerana ada caj perkhidmatan kecil yang kami tambah pada harga kedai. Dalam mana-mana keadaan di atas, sekiranya anda ada melihat produk yang anda rasa mempunyai kesilapan harga, sila hubungi kami dan kami akan berusaha untuk mencari penyelesaian yang adil! Kami berhak untuk membatalkan barang yang mempunyai kesilapan harga. 11. Bagaimanakah anda memproses barangan yang tidak-Halal? Kami membenarkan anda membeli barangan tidak-Halal menggunakan HappyFresh , dan kami amat berhati-hati untuk memastikan bahawa tiada titik semasa semak keluar, penghantaran, atau pada waktu lain, bahawa barangan Halal dan tidak-Halal akan bersentuhan antara satu sama lain. 12. Bagaimanakah boleh saya memeriksa status pesanan saya? Anda akan diberitahu dalam masa nyata apabila pesanan anda dibungkus, apabila ia dalam perjalanan dan apabila ia telah hampir tiba. Sila pastikan untuk memasang ‘pemberitahuan tolakan’ atau ‘push notifications’ anda dalam tetapan telefon anda. Anda boleh juga pergi ke ““Status Pesanan Saya”” bagi memeriksa status pesanan anda. 13. Bagaimanakah boleh saya membuat perubahan kepada pesanan saya? 14. Apakah polisi pembatalan anda? Sebaik sahaja pesanan anda diletakkan dan pembeli peribadi kami telah mula memilih barangan anda, atas sebab teknikal, anda tidak boleh membatalkan pesanan anda. Namun, anda boleh menyemak semua barangan anda sebelum menerima mereka di pintu. 15. Bagaimanakah boleh saya melaporkan masalah dengan pesanan saya? Jika anda mempunyai sebarang masalah dengan pesanan anda, sila beritahu kami! Anda boleh hubungi kami di 03 – 9212 0192 atau tulis kepada mysupport@happyfresh.com. Aduan atau permintaan yang memerlukan bayaran balik mesti dibuat dalam tempoh tiga (3) hari selepas pesanan anda telah diserahkan. Sila ambil perhatian bahawa bayaran balik untuk barangan mudah rosak dan / atau separuh mudah rosak (misalnya ikan, sayur-sayuran, produk tenusu, buah-buahan, roti, bawang, kentang, pai, kek dan sebagainya) hanya akan dipertimbangkan jika barang-barang ini tidak diterima pada masa penghantaran. Bayaran balik tidak akan diberikan jika anda tidak menjangkau kami mengenai bayaran balik yang dikehendaki dalam tempoh masa yang dinyatakan di atas. 16. Apa yang berlaku jika saya memilih untuk membayar melalui kad? Kami akan membenarkan sejumlah kecil untuk tujuan pengesahan kad. Anda tidak akan dikenakan bayaran untuk jumlah ini. Sekiranya anda memilih untuk membayar dengan kad kredit, kami akan mengenakan kad kredit anda untuk caj akhir berdasarkan barangan yang dihantar dan diterima sebaik sahaja pesanan anda lengkap. Bank anda akan mengemaskini caj akhir pada kenyataan anda dengan sewajarnya selepas penghantaran. Sekiranya anda memilih untuk membayar melalui kad debit, anda mungkin akan dicaj / dibenarkan jumlah yang dibilkan sebaik sahaja anda melengkapkan proses checkout di App / Laman Web kami. Apabila penghantaran lengkap, (i) jika amaun akhir anda lebih tinggi daripada amaun yang dibayar semasa checkout, kad debit anda akan dicaj bil akhir yang baru dan amaun yang dikenakan terlebih dahulu akan dikembalikan kepada kad debit anda; dan (ii) jika amaun akhir anda lebih rendah daripada amaun yang dibayar semasa checkout, baki akan dikembalikan mengikut amalan standard bank anda. 17. Bilakah saya akan menerima pembayaran balik? Jika anda membayar menggunakan kad kredit, bayaran balik anda akan dibayar balik ke dalam kad anda mengikut amalan standard bank anda. Sila ambil perhatian bahawa setiap bank akan mempunyai tempoh masa yang berbeza untuk mencerminkan jumlah bayaran balik dalam akaun bank / kenyataan anda. Sekiranya anda membayar menggunakan tunai semasa penghantaran, bayaran balik akan dibayar kepada anda dalam bentuk kod baucar, yang akan dihantar dalam jangka masa 5 hari bekerja. Kod baucar ini membolehkan anda mendapat diskaun untuk pesanan berikutnya di mana nilai baucar tersebut bersamaan dengan jumlah bayaran balik. 18. Bagaimanakah boleh saya melihat resit saya? Anda akan menerima resit anda melalui e-mel selepas anda telah menerima barangan anda. 19. Bagaimanakah boleh saya memulangkan beg-beg HappyFresh saya? Kami menggalakkan anda memulangkan beg-beg HappyFresh anda yang masih dalam keadaan baik kepada driver HappyFresh yang seterusnya untuk penggunaan semula. Sila ambil perhatian bahawa disebabkan ketersediaan stok, kami tidak selalu menyediakan beg HappyFresh dengan pesanan anda. 20. Bagaimanakah boleh saya memulangkan barangan? Jika anda tidak berpuas hati dengan barangan yang telah kami hantarkan. Anda berhak untuk tidak menerima produk tersebut dengan memberitahu kakitangan penghantaran kami. Tiada caj yang akan dikenakan bagi produk tersebut. Kami hanya akan mengenakan caj bagi barangan yang diterima anda sahaja. Setelah anda menerima pesanan anda. Transaksi pembelian adalah dianggap muktamad dan sebarang pemulangan produk adalah termaktub kepada keputusan pihak pengurusan. Jika anda mempunyai sebarang aduan, anda boleh menghubungi Pusat Khidmat Pelanggan kami di mysupport@happyfresh.com dalam masa 72 jam. Anda digalakkan untuk menyertakan bukti bergambar sebagai tujuan pemeriksaan yang lebih lanjut. 21. Siapakah yang akan memilih barangan saya? Barang runcit anda akan dipilih oleh Personal Shoppers yang ditapis terlebih dahulu dan dilatih secara profesional. 22. Siapakah yang akan menghantar pesanan saya? Pesanan anda akan dihantar oleh pemandu kami menggunakan motosikal dilengkapi dengan satu kotak penghantaran direka bentuk dan ditempah khas. 23. Apa yang berlaku kepada diskaun saya jika ada produk yang kehabisan stok? Semua promosi kami digunakan untuk nilai bersih barangan yang dihantar (Diselaraskan selepas penggantian produk yang kehabisan stok) Sebagai contoh: Jika anda membuat pesanan bernilai RM200 dan mempunyai kod diskaun sebanyak 20% OFF atas pesanan anda. Dalam kes di mana RM200 asal anda mempunyai nilai barang bernilai RM60; diskaun 20% akan dikenakan ke nilai bersih pesanan anda iaitu RM140. 24. Bolehkah saya memesan dari pelbagai kedai dalam satu pesanan? Pada masa ini, membeli barangan dari lebih daripada satu kedai dalam satu pesanan tidak disokong. Namun, anda boleh membuat dua atau lebih pesanan daripada pasaraya dan kedai khusus yang berbeza dengan slot masa penghantaran yang anda inginkan. 25. Bolehkah saya menambah nota beli-belah (contoh: pastikan ayam dipotong, ikan dibersihkan) kepada produk yang saya pesan? Ya, anda boleh melihat bahagian yang bernama “Tambah nota untuk pembeli” di bawah setiap item yang telah anda masukkan ke dalam troli anda. Klik dan nyatakan permintaan anda! Pembeli Peribadi kami akan cuba memenuhi keperluan anda. Peraturan pasar raya dikenakan. 26. Adakah HappyFresh menghantar ke pejabat? Ya, semestinya! Jika anda mahukan perkhidmatan penghantaran runcit yang lebih sesuai untuk keperluan pejabat bulanan anda, jangan ragu untuk menghubungi HappyCorporate. 27. Saya mempunyai lebih banyak soalan untuk anda! Beritahu kami! Kami sedia menunggu anda di mysupport@happyfresh.com atau anda boleh hubungi 03-92120192.